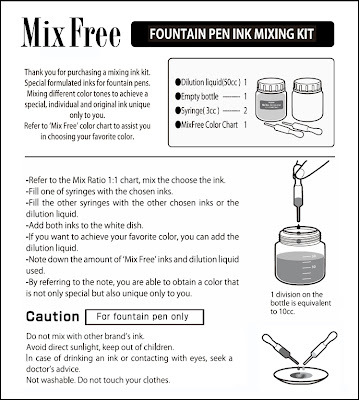 Platinum Mix Free Fountain Pen Ink Mixing Kit is the ideal solution for mixing inks safely and easily to create a multitude of colors with a minimal number of ink bottles. This series of ink created by Platinum removes all fear of unexpected, messy pen-clogging reactions that can occasionally result from mixing different types of fountain pen ink together. These inks are specially formulated to be mixed together and to encourage personal expression through your own custom ink colors. 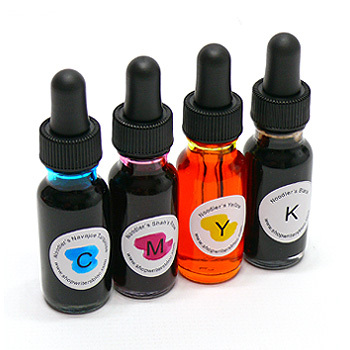 The kit includes 60ml bottles of nine different colors of ink: Sunny Yellow, Leaf Green, Earth Brown, Flame Red, Cyclamen Pink, Silky Purple, Aurora Blue, Aqua Blue and Smoke Black. It also includes a handy mixing kit containing one 50ml bottle of dilution liquid, one empty 50ml bottle for saving your custom ink and two 3ml dropper syringes. 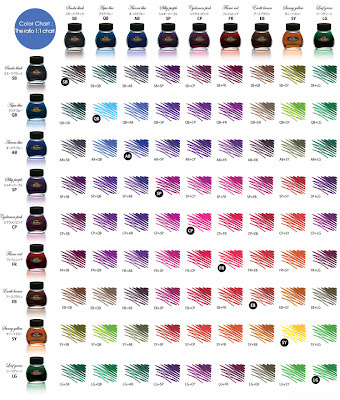 There are simple instructions included on how to begin to create your custom ink colors. This kit also comes with a color chart showing how a mixture of equal parts of two different colors of ink can create a new color. (I believe there are 36 different colors displayed here in addition to the 9 basic colors, but I could be wrong.) Adding the dilution liquid can lighten the color. Of course, you’re not limited to a 1:1 ratio while mixing – feel free to experiment with whatever ratio you want! 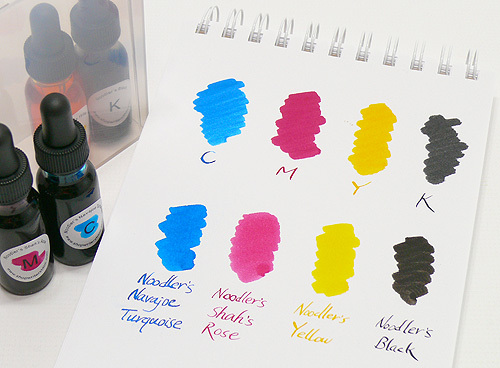 If an entire kit with 9 bottles and ink mixing accessories is too much to buy all at once, or if you’d like to try out just one color first, you can buy the individual bottles and the mixing accessories separately. You can also mix all sorts of custom ink colors by getting the four very basic ink colors of cyan, magenta, yellow and black – or as translated into Platinum Ink colors: Aqua Blue, Cyclamen Pink, Sunny Yellow and Smoke Black. 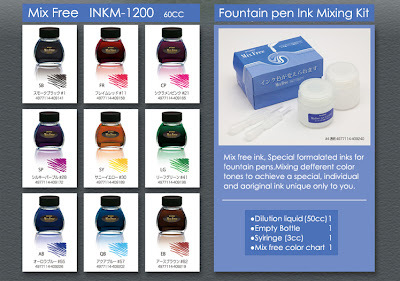 What interesting colors have you created with Platinum’s Mix Free Fountain Pen Ink Mixing Kit? Please share your colors and mixing ratios here! My previous experiment mixing J. Herbin Terre de Feu brown fountain pen ink was done with 5 parts Terre de Feu and 1 part another ink. Part 2 of my mixing experiment was created with 1 part Terre de Feu and 1 part another ink, definitely producing more varied and interesting results. I may not want to write with all of these colors but I think they would look great as part of a painting, sketch or other artwork. One part J. Herbin Terre de Feu plus one part Noodler’s Black equals a very dark brown-black. Terre de Feu and Noodler’s Shah’s Rose make a delicious looking raspberry wine color. Something that would go well with this weekend’s BBQ. A burnt caramel color with lots of shading is produced with Terre de Feu and Noodler’s Yellow. I would put it in the ochre category. Noodler’s Navajo Turquoise and Terre de Feu creates an inky grey-blue color that reminds me of something I would see in nature – a whale, a bird, a night sky. J. Herbin Lierre Sauvage plus Terre de Feu makes a dark mossy pond-slime green. I can visualize this color in a pine forest, murky pond or on a rock on the beach. 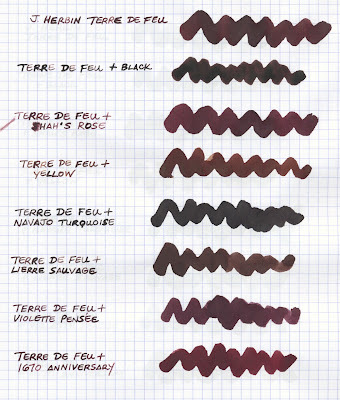 Terre de Feu mixed with J. Herbin Violette Pensee produces a dark grape-y purple color. I might call it a dark purple-burgundy. Lastly, Terre de Feu and J. Herbin 1670 Anniversary ink together make brick red. 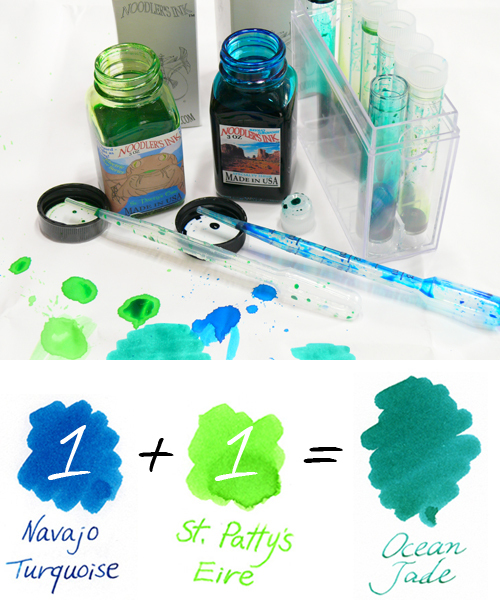 Do you have any favorite ink mixing recipes you’d like to share? I’ve been wanting to mix brown ink to create different shades of chocolate and finally found some time to give it a try. 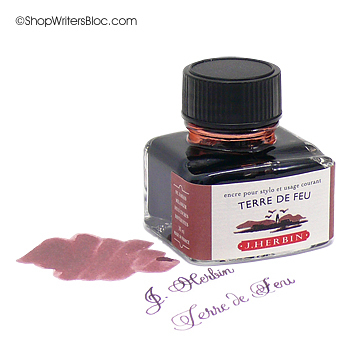 I chose J. Herbin Terre De Feu because it seemed like a good medium brown color to get started with, but J. Herbin Lie de Thé or Café des Îles probably would have been good choices too-colors for future ink mixing for sure. This ink has a red tone it, so the name Terre de Feu or Land of Fire seems very fitting. For this experiment I used a ratio of five parts J. Herbin’s Terre De Feu ink and one part of another ink. Terre de Feu plus Noodler’s Black ink produced a nice dark chocolate brown color with reddish undertones. Terre de Feu and Noodler’s Shah’s Rose created a dark maroon color that I’d put in the “red wine” category as opposed to the chocolate category. Adding Noodler’s Yellow to Terre de Feu made the best milk chocolate color in this bunch. Noodler’s Navajo Turquoise and Terre de Feu made a brown-black that at first glance just looks black to me. 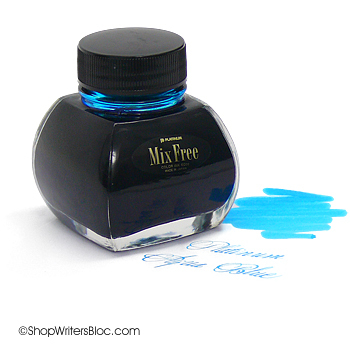 It’s amazing how adding one part turquoise blue ink can create such a dark color. If I’m in the mood to write in brown-black ink in the future I’ll have to keep this one in mind. 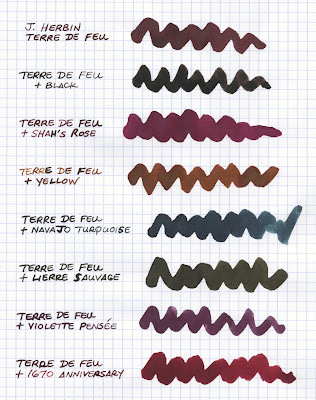 Terre de Feu and J. Herbin Lierre Sauvage (green) also created a nice chocolate brown that has a bit more of a yellow undertone in it than the Terre de Feu plus black. J. Herbin Violette Pensée and Terre de Feu mixed together made a dark maroon color that I would also categorize as “red wine”. Terre de Feu and J. Herbin 1670 Anniversary ink (red) produced what I would call a burnt umber or red-brown color. Interestingly, the character of Terre de Feu ink was such that it did not want to stay in the grooves of my glass pen and made the writing samples a bit difficult except for the combination with the 1670 Anniversary ink. No harmful explosions occurred as a result of mixing these particular colors of Noodler’s and J. Herbin fountain pen inks. Stay tuned for part two of this experiment using different ratios of ink colors. 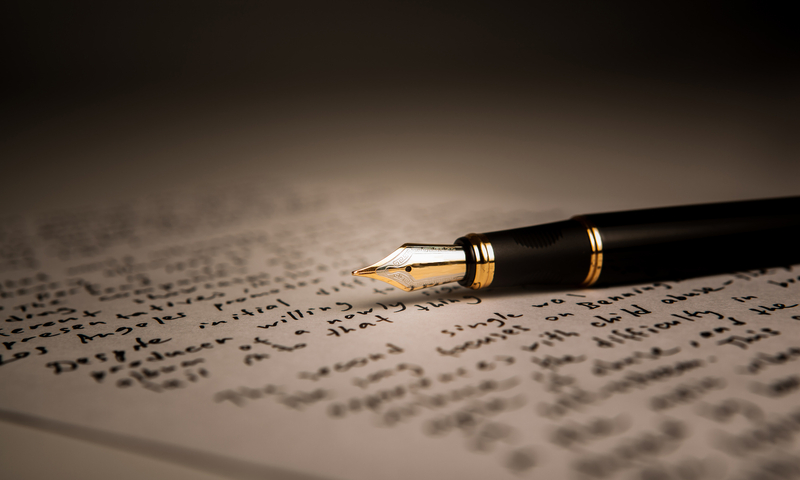 What is your favorite brown fountain pen ink? J. Herbin 1670 Anniversary Ink is a limited edition red ink created to honor the 340th anniversary of the J. Herbin ink brand. Since it is only available for a short time, I thought I’d better start my experiments with this ink right away! Bleu Pervenche plus 1670 Anniversary ink creates a dark purple-grey color. It looks rather like a purple-black when writing with it. Rose Cyclamen with 1670 Anniversary ink makes a color that I would call “fruit punch”. It makes me want to reach for a tall glass filled with ice and something delicious! 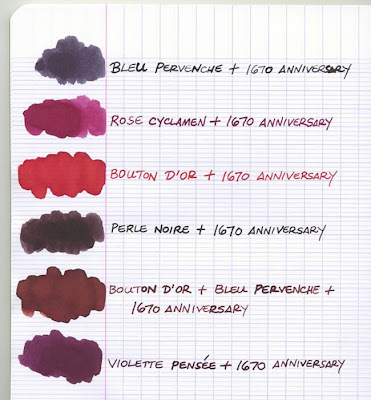 Bouton D’or and 1670 Anniversary ink created an amazing scarlet or vermilion color that I really love. 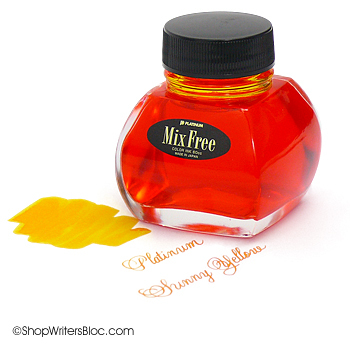 It is a bright orange-red color even when you are writing with it. Perle Noire with a touch of 1670 Anniversary ink makes a conservative espresso brown, or a black-brown color. The next mix that I did is a little more complicated. I used green ink mixed from 5 parts Bouton D’or and 1 part Bleu Pervenche. 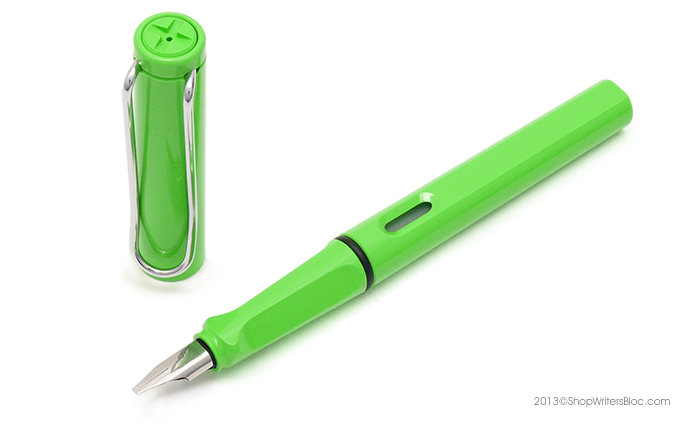 This green turns out to be quite similar to J. Herbin’s Vert Pré. When you use 5 parts of this green and one part 1670 Anniversary you get a rich milk chocolate color with some very nice shading! Finally, Violette Pensée and 1670 Anniversary ink makes a plum color that really reminds me of Cabernet Sauvignon wine. If you are a fan of red wine I think you’re really going to love this ink color! Hmmm…. I seem to be sensing a food theme for the ink color descriptions today. I think it’s almost dinner time as I write this post. My favorites of this experiment are the scarlet, milk chocolate and wine colors. How about you? 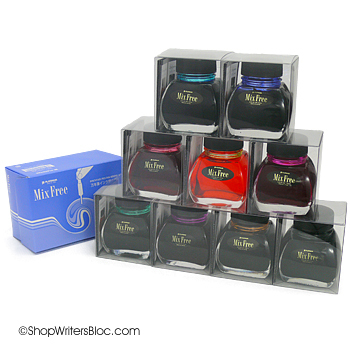 Do you think you might try mixing any of these or other colors yourself while the 1670 Anniversary ink is still available?